2018 Mar Vista Green Garden Showcase: Mar Vista Community Council given an award for environmental efforts! Mar Vista Community Council given an award for environmental efforts! I am pleased to be the bearer of some good news. 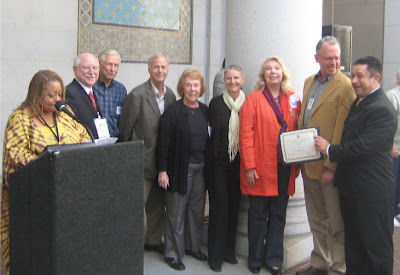 The Mar Vista Community Council was selected to receive the First Annual Neighborhood Council Peer Award which was presented during lunch at the Empower LA 2009 A Congress of Neighborhoods on October 10, 2009 at City Hall. We were honored in the “Environmental” category. There are four categories, and two winners in each category. So we are among 8 Councils that were honored out of 89 community councils in Los Angeles. A huge thank you to the community effort throughout MVCC that earned this recognition! Most important, it is exciting to know that our efforts are inspiring other communities.